Wow, you guys. Nearly 2,000 of you have accepted the Thirty-Day Quiet Time Challenge in the last two weeks, and that is spread across over 40 countries! That’s incredible! The very first email went out late last night, to be waiting in your inbox bright and early this morning. Some of you might be just hearing about the Challenge now. Some of you heard about it after a friend posted their quiet time this morning and decided to hop on the party bus. Here’s all the information you need to know to get caught up! What is the Thirty-Day Quiet Time Challenge? It’s a challenge to Christians worldwide to commit to collectively chasing the sleep away by digging into the Word of God every single morning, with the end goal of cultivating a daily habit that will last well past these next 30 days. What do I need for the Challenge? All you need is your Bible, a spiral notebook, and/or journal. You might decide to put your journaling notes in the same place as your prayer journal. I prefer to keep those separate – but it’s entirely up to you! How much time should I plan for? The beauty of this Challenge is that you can take as much time as you like. It can be as little as 15 minutes, or as much as 45-60. 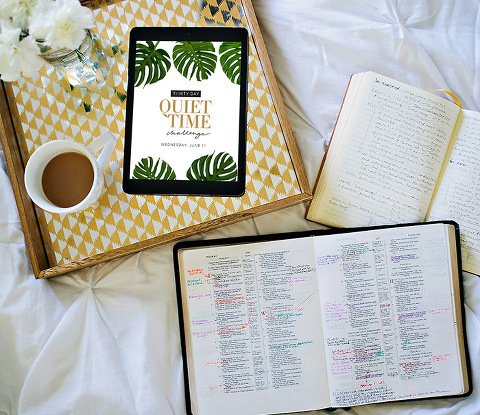 I will provide the starting point of your quiet time, as well as additional “digging deeper” options for those of you that want to linger longer in His Word! Where do I start reading my Bible? That’s the golden question asked by most people who have never had a dedicated quiet time. The truthful answer is that there’s no wrong place to start reading. But there is a wrong time: tomorrow. Later. Because those tend to end up being never. We will begin our journey together in the book of Luke. Why Luke? Well, because I think it has the best opening story. If you want to know about Jesus, the best place to begin is at the very beginning of His life, right? Luke is also one of four accounts of the life and teachings of Jesus, and it’s a relatively easy read. Why is a quiet time so important? That can be a long and complicated answer because there are so many benefits to a daily quiet time. But the most important answer is that spending time daily in God’s Word is essentially acclimating yourself to His voice and learning to have a daily conversation with Him. That, sweet friends, is an irreplaceable gift. And one well worth pursuing. Quick Tip: You will likely have some questions come up as you go. Write them down and set them aside to keep on the reading track. Then, at the end of the 30 days, revisit them. Pray through them. Use your concordance, and ask trusted friends, mentors, or pastors for their insight. Ready to accept the challenge? Head on over to this page to sign up! Emails are sent at out nightly at 10pm HST to ensure they’re waiting for you bright and early when you wake up in the morning. Did you miss Day One? Click here to get caught up.